Will Textbooks in a Backpack Stop Bullets? In a recent day to the range, ConcealedCarry.com decided to answer a question that when revealed led to some results that we did not expect. School shootings are one of the most fearful and persistent thoughts that go through our head. Whether we are parents, students, or teachers ourselves, the idea of a heavily armed and highly disturbed person walking into a place that has barely any means to defend itself and unleashing carnage is a horrific concept. Many times over many years, politicians and citizens have sought to even the odds by arming trained faculty of schools in the event of a shooter, but have been met with very little success around the country. So at our range day, we expected to show just how defenseless students are, by firing shots at the closest thing most schoolchildren have as protection. Their textbooks and their backpack. What we thought would happen, would be a bullet cutting through like there was nothing there, but as you can see in the video below, the results were a bit more than even we were expecting. As you can see in the video, we fired a .380 pistol at the backpack and six textbooks within, but we were not even able to penetrate through the second book with that kind of firepower. But that wasn't the only kind of firepower that we had with at the range, that day. Next we tried a shot with an AR-15 and even this powerful rifle, with rounds traveling at over 3000 ft per second could not penetrate through the third book. It was at that point that we knew that there was something to this and like our own at the range Mythbusters, the final test went for overkill. As we shot 5 rounds in quick succession, aiming for the same place and found that not one bullet penetrated past the fifth book and none of them had gotten through. So interestingly enough, there is a level of protection for your students at their school. Shielding yourself with a backpack full of textbooks can be mighty effective in a last resort scenario. Is there anything else you would like us to test and see its bulletproof capabilities? Let us know in the comments below. But be sure to take a look at our “What is and isn't bulletproof” article. 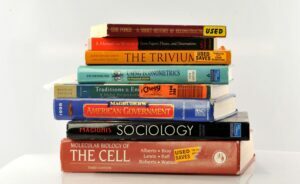 14 Responses to Will Textbooks in a Backpack Stop Bullets? In ancient times silk was used as a defensive article, it would be interesting to see how effective it would be when matched with other items normally carried. A .380 is the smallest of the .38 cal, the AR-15 is simply a .22 bullet (.223) and books wlll stop them, but will not stop a 30.06 which will go through a rail road track with armor piercing bullets, I have seen it at our shooting club’s range, yet the AR-15 is the gun liberals like to demonize and it’s not near as powerful as the reliable old deer rifle 30.30. By the way, we live in ain in twin city of Arkansas and Texas and all 20 schools still use books. Yeah, but the two most prevalent rounds in the world are 9mm and .223. While magnum rounds would go through all five, most thugs don’t carry magnums. They are hard to hide in your waistband and they are heavy to lug around all day. I think this test was pretty interesting. There are crazies out there who flip out and start blasting. Its good to know that some kids might be saved by their ever present backpacks. John, 1 ream of paper is probably equivalent to 2-3 of the text books we tested in this video. Should stop most small arms fire and maybe 1 or 2 shots from a rifle but repeated shots would penetrate. It’s not just the stopping that matters, it’s also the slowing down. In the first test the bullet got stopped by the second text book. Which implies that it got slowed down a lot by the first one, possibly turning a lethal shot into something survivable, even if there’d only been one text book. And if the angle had been more like 45 degrees rather than 90 maybe the bullet wouldn’t even have got through the first text book. Is there anyway you guys could test a guard dog bullet proof backpack with multiple books inside with an AR 15? One shot and then repeated shots?I would really like to know how it differs from a regular backpack with multiple books. Curious if you would need less books to protect your kids.? I LOVE your group, but PLEASE don’t tell people books are bulletproof. I will only type in generalities because many people do not understand ballistics (thank God) and the last thing we need is bad guy instruction. Without even referring to armor piercing bullets (I am NOT), simply, “certain” bullets with “certain” properties would have likely killed a person hiding behind books, even with the 380. Moving onto a rifle bullet, not a chance a book or books will stop a 223 reliably, again depending on the bullet choice. The LOWEST of rifle loads will shot thru 4 class IIIa bulletproof vests stacked on top of each other, AGAIN, depending on bullet choice. If books were the magic answer swat teams would be wearing vests with old English books in them! I don’t think we ever said something as generic as “books are bulletproof.” However, I think it is obvious that with enough books you can stop a bullet, even ANY bullet can be stopped with enough of them. The purpose of this video/article was to discover HOW MANY books it would take to stop rounds from common firearms including the AR-15 in .223/5.56mm. I think we demonstrated this successfully in this instance. This particular backpack load represents what is commonly found in many college students’ and even some high school students’ backpacks today. Even if a student doesn’t carry with them this many textbooks, in an active shooter scenario, provided they have some time, it doesn’t take much effort to find and load their backpack full with books. I am confident that a full backpack would prove adequate for most situations. Those last words–last resort scenario–are key in understanding that this is not ideal, nor is this practice certifiable or rated by any laboratory or testing agency as being “bullet resistant” as results most surely will vary. But it implies if you’ve got nothing better to do, here is a last resort option to consider…a mighty fine one at that, I think. Thanks for being a valued customer and contributor!! This article and ones like it are dangerous in their stupidity! First off if you are going to test something you mention the type of ammo used and you also make an attempt to test the actual topic. Is it safe behind the book bags? I have seen several of these videos, all done by idiots new to guns. Chances are the people doing the “test” thought hollow points were the baddest things on the planet. I have shot a really high quality hollow point at level 3 body armor and yes it stopped it. A full metal jacket (like the standard 9mm nato) will shoot right thru it, AND a hard cast bullet will shoot thru AN ENGINE BLOCK. So the question is will the bad guy be concerned with over penetration? Oh, I doubt it. On the 223. I have no idea what bullet they used but I have seen some solids shoot thru AMAZINGLY thick steel and very large trees and thru more books that this. Merely a heavy solid 223???????????? I again suspect that when they mentioned 3000 fps it might have been a varmint load , AND a very light bullet, etc…… Next, many people die because they has a metal plate, a level 3 vest but no trauma pad. Sure, if you have to block a bullet, do what you can, but telling people their book bag offers safety (the feared book bag with 6 thick text books which NO ONE HAS EVER USED IN THEIR LIFE) is irresponsible. William thank you for your comment. I don’t feel we suggested using textbooks as a primary means of defense but set out to show that they can theoretically be used as a “last resort” in attempting to protect oneself. We sell and have published videos on the use and effectiveness of body armor as well so it isn’t our intent to prove anything definitive with this video… only to illustrate that the results may be different than what one might expect. All rounds fired were FMJs, not hollow points. I hope in the future you will learn more about us before you pass such harsh judgment but all the same, we appreciate the critical comment and will try to be more clear in the future.